Thoroughbreds are known for their speed and courage on the racetrack. Once their racing careers are over, off the track thoroughbreds, athletic and intelligent by nature, are willing pupils for retraining in a number of disciplines including but not limited to: eventing; Western and English pleasure; hunter / jumper; Western performance; games; polo and polocrosse, or just being a companion horse. 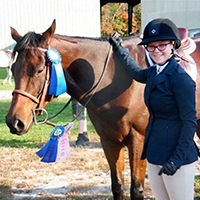 New Start is committed to placing retired racehorses in an environment where they will thrive and realize their full post-racing career potential. We offer horses that have been vetted and seek to pair them with horsemen under whose care and training they can be happy, safe and excel at their new challenges. New Start's horses are sent from the track to one of our foster farms where they begin their transition into their new starts. Our foster farms do their best to pair the adopter with a horse that meets their specific needs. After the adoption, the adopter can contact the New Start committee, comprised of horsemen and veterinary professionals, for help and guidance. We want our horses to go to competent horsemen who know a thoroughbred requires more feed than other breeds; they need adequate stall space with clean bedding and occasional veterinary care. We ask our adopters to keep the committee up to date with the goings-on of our horses by submitting adoption updates and pictures at two, five, nine and twelve months following the adoption. New Start has horses available for adoption which will make great pasture pets or companion animals. Adopters must complete an adoption application and meet New Start's requirements. Below is the contact information for our foster farms who can help you find a horse.